I’ve owned plenty of cookbooks in my lifetime. More than I need, more than I’ll ever be able to cook from, even if I tried a new recipe every day and lived to 105 years old. Seasoned cookbook enthusiast that I am, my next statement may surprise you, but don’t take it lightly: Radically Simple by Rozanne Gold is my favorite. Ever! No other book tempts me to cook every single recipe within it, as this one does. All her recipes are appealing, not for their simplicity, but because she always transforms a few ingredients into something special, something different, something unique and enticing. Take this humble orzo, for example, and dress it up just right. Place the baby carrots in the bowl of a food processor and process a few times, until the pieces are a little bigger than the grains of orzo. Comments: If all recipes in this cookbook please me as much as this one, it will be hard to cook from a different source! 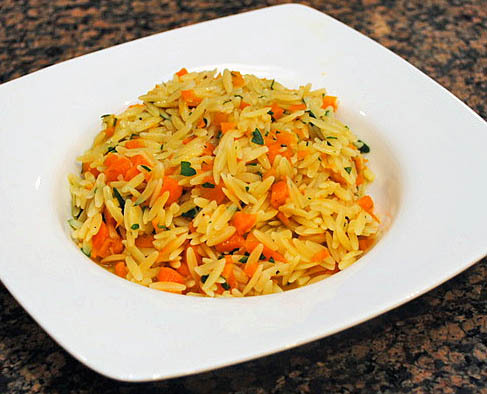 😉 Toasting the orzo and treating it like Arborio rice in a risotto preparation considerably changes the texture of the pasta. Orzo has a tendency to be a bit “slippery”, but not in this dish: it feels wholesome, binding nicely with the other components. The bits of carrots give a hint of sweetness and add a lot to the dish. I had to exert extreme self-control to put the leftovers in the fridge, instead of leaving them in front of us while we talked after dinner. Those can be very caloric conversations! Potato puree is comfort food “par excellence”. One of my favorite menus on a chilly evening is braised short ribs served over mashed potatoes (I gained about 3 pounds just by typing that sentence! 😉 ) Sometimes I crave that type of side dish, but I’d be happier with a lighter caloric load. Giada de Laurentiis devised a perfect alternative during her “Light and Fabulous” menu, that paired broiled tilapia filets with a creamy puree of carrots and yams. You can find the recipes for that episode here. 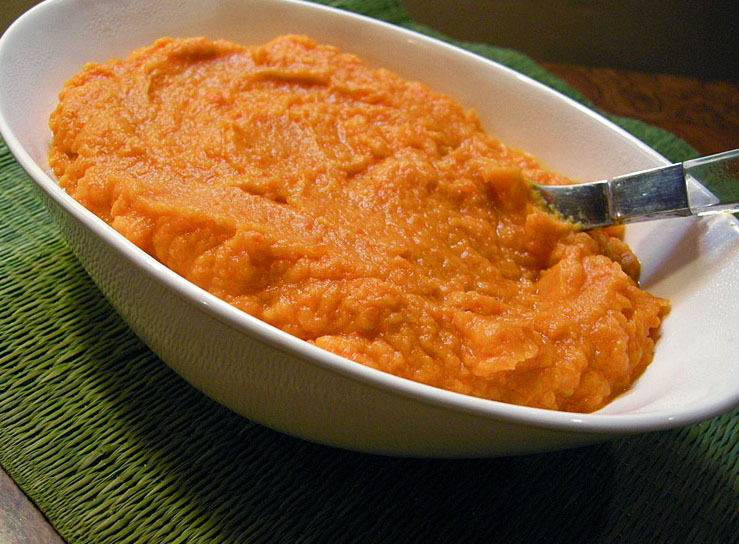 The puree has a beautiful, bright orange color, and its taste complements many main dishes. Heat the oil over medium-high heat in a saucepan. Add the shallot and cook until tender, about 5 minutes. Add the garlic and cook for 1 minute until fragrant. Add the carrots, sweet potatoes, 1 teaspoon salt, and 1/2 teaspoon pepper. Cook for 5 minutes until slightly softened. Add the stock and water and bring to a boil. Reduce the heat and simmer until the veggies are tender, about 25 minutes. Drain the veggies, saving the cooking liquid. Transfer them to a food processor, and puree until still slightly chunky, adding some of the cooking liquid, until you reach the consistency you like. Taste and adjust seasoning with salt and pepper. Comments: Our grocery had sweet potatoes, but not yams, so that’s what I used. Next time I’ll add a touch of ginger to the puree, because it goes so well with sweet potatoes. Maybe a little orange zest too? But even without these additional touches, this puree was an excellent side dish for our grilled, butterflied pork tenderloin. Something about eating bright colored food instantly makes me feel healthy. This puree tastes good, it’s not too heavy, and it gives that feeling of happy satisfaction at the end of the meal.